Thinkbucket began life in 1999 and was born out of the frustration of founder, Jonny McEwen, that within the peacebuilding world, art was used only when it was raining and tended to be characterised by cliché. After seeing his umpteenth papier-mâché mask and fused Irish and British flags he decided to do something about this. What was needed was a creative thinktank. That term was too big though. Something a little smaller was needed. Something to draw out and carry ideas – a thinkbucket. Gathering around him a team of artists, musicians, writers, creative thinkers, and people in the wrong job (I’m still unsure which category I fitted into), together we explored ways of sharing new approaches and resources for community relations work which were freely shared online. We tried to act as a catalyst for creative thinking and to meet a clearly identified need from practitioners for innovative and effective resources through which emerging and existing issues could be explored. The Thinkbucket team, or Thinbucketeers, specialised in contributing a creative element to conferences and were commissioned by organisations to help them develop new ideas for looking at old problems. We discovered that because there was a playful element to the way in which a subject was being explored, people often shared more and were therefore more engaged than if it had been approached in a more serious manner. It wasn’t about dismissing the importance of serious conversation but an acknowledgement that such approaches were often the only ones available. There was room for both. The role of the arts and of playfulness are becoming increasingly recognised as not something to be dismissed lightly or marginalised. Within the world of peacebuilding their importance and value is developing. This is not about being silly for the sake of being silly. It’s not a case of dumbing down important subjects by introducing a playful element. This is rooted in solid theories advocating the value of the concept of play and the arts and their significance in peacebuilding work, and attempts to bring about social change. Stuart Brown’s book ‘Play: How it Shapes the Brain, Opens the Imagination and Invigorates the Soul’ is a wonderful examination of the essential role of play in our lives and the danger of placing too much on an emphasis on needing to address serious issues in serious ways. It concludes that not only is play a crucial social mechanism, but a lack of it has a significant impact on personal and community development. John Paul Lederach dedicates a whole chapter in his book ‘The Moral Imagination’ to the role of the arts, and talks about how a moving artistic performance at a conference will always remain with him years after the content of speeches and project proposals have been forgotten. He explores the idea that we have placed too much emphasis on the intellectual process of trying to build peace and have “failed to nurture the artist”. Through reconnecting with our inherent creative nature, he reflects, we develop the capacity to become aware of new perspectives and subtle layers of a situation that we normally overlook. Purely trying to address social change on an intellectual level is destined to fall short. Creative approaches to addressing social problems can be found around the world. Antanas Mockus, during his time as Mayor of Bogotá, Colombia, used a variety of innovative initiatives such as hiring 420 mime artists to make fun of bad drivers. Not only were his approaches creative, but they were highly effective. An organisation called The Fun Theory work on the principle that the easiest way to change people’s behaviour for the better is by making it fun to do. Faced with the challenge of getting more people to use the stairs in a Stockholm train station they turned the stairs into a series of working piano keys. People stopped using the escalators because they enjoyed using the stairs more. 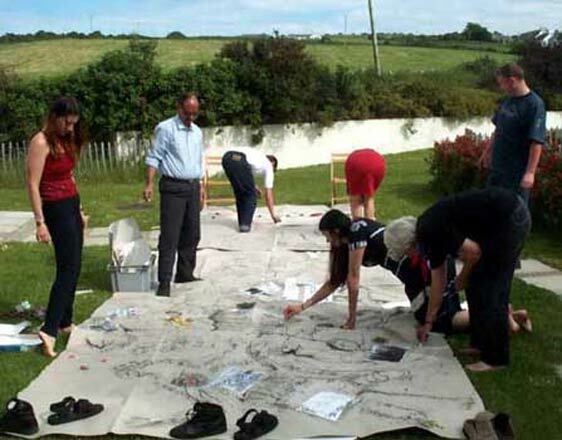 It was in this context that Thinkbucket was invited by the Irish Peace Centres to contribute to their 2011 Summer School. We were asked to add a creative dimension to the overall aims of providing an opportunity to sample IPC’s peacebuilding approaches, and developing a temporary learning community in which people could share ideas and reflect on key issues. The invitation was in many ways rooted in a desire for the summer school to create a different space to the familiar, generic conference experience which at best is often functional and at worst, boring and uninspiring. Rather than being included as some stand-alone artistic input on the periphery, the creative contribution of Thinkbucket was intended to act as a ribbon tying various parts together. Our goal was to come up with ways of capturing some of the dynamics, feel and content of what was happening and share it in ways that both informed and sparked conversation. We wanted to try and satisfy a natural curiosity about what was happening elsewhere by visualising what was going on across the whole of the conference and presenting these in ways that caused people to stop and look. Framing the whole approach was a desire to complement the admittedly limited nature of an evaluation form filled in at the end of a gathering such as this, and their tendency to miss out on subtle and emerging insights and observations that unfold throughout each day. From a peacebuilding perspective, our approach focused on the concept of deliberately creating relational spaces and the principle that it is in these where social change takes place. We were combining our creative methodologies with ones rooted in peacebuilding practice in an attempt to help build what Lederach calls ‘webs of relationships’. Acting as a spark for conversation and interaction, our input aimed to recognise and build these spaces. Not having the capacity to interview everyone and gauge in detail individual levels of interaction and engagement, we focused our evaluation efforts on measuring impact through observing group dynamics and responses to the ongoing creative dimension we offered. Dressed in blue and often seen scurrying around like industrious smurfs, the Thinkbucket team set about their work of trying to create alternative ways of looking at what was going on and reflecting back the many layers of what was on view. As people gathered on day one, feet were filmed as they passed through the entrance and everyone was asked to offer one word. These were put together into a short video that was shown the following morning, offering a brief snapshot of a Monday morning, prompting both reflection and smiles. Each day we asked different questions that people responded to via text or a piece of paper. The answers were written up on masking tape that criss-crossed lobbies and hallways, causing people to stop in their tracks, read what others had to say and start new conversations with those around them. 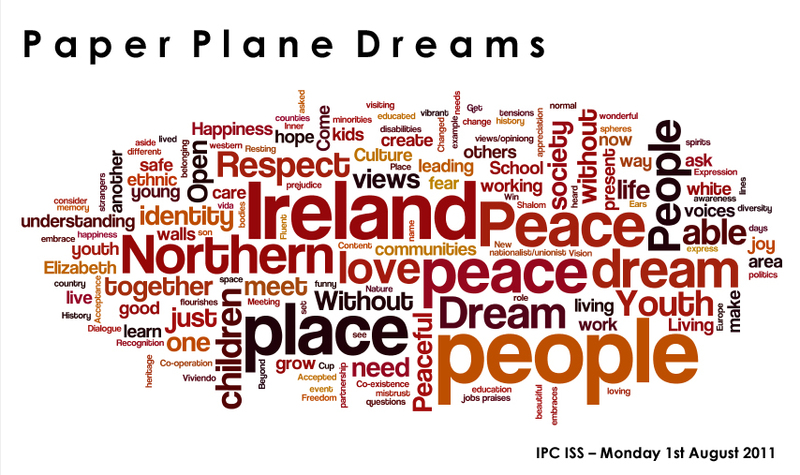 Participants’ dreams for Northern Ireland, so enthusiastically turned into paper airplanes at the end of the first keynote speech were typed up and, using a website called Wordle, turned into ‘wordclouds’ in which the most commonly used words appear largest. Our role was not to analyse the content, but to contribute to this shared learning environment through finding quick, visual and innovative ways of sharing what was going on. 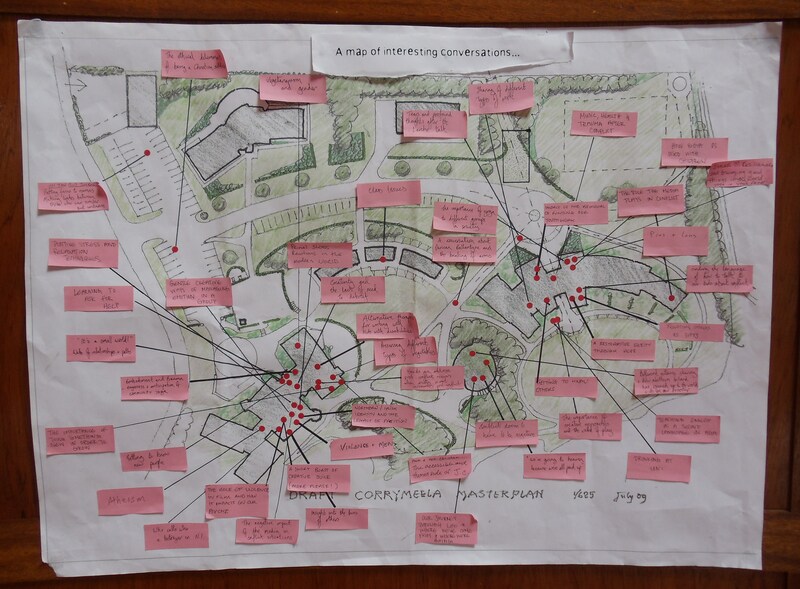 A ‘Map of Interesting Conversations’ charted ongoing interactions across the site in ways that a written evaluation could not have done. It piqued people’s curiosity and captured their imagination prompting regular visits to the Thinkbucket Hub in the main house to share conversations ranging from ‘The role of violence in film and how it impacts on our psyche’, ‘Music, health and trauma after conflict’, through to ‘A conversation about Duncan Bannatyne and the breaking of arms’. A short Thinkbucket exercise involving scribbled animals that were quickly rubbed out by others around the table was an opportunity to show how an arts-based exercise can act as an introduction to deeper conversations around conflict. The principle is simple. Allow someone to experience the emotions of conflict and then use that connection between feelings and thoughts as the framework for a broader conversation that a purely intellectual approach would have missed. Creativity, fun and play are not to be dismissed as being unworthy of serious issues. They have a valid and important role in peacebuilding work. When we accept that we are not going to solve key issues on a purely intellectual level we begin to acknowledge that we are emotional beings. It’s often creativity, play, music, drama and art that speak to those emotions in a more profound way. They offer some kind of bridge between the heart and the mind. In a world where we regularly hear talk of building bridges, this one in particular is one that is too often ignored. Originally published in the Autumn 2011 Irish Peace Centres Newsletter. Yes indeed. Thinkbucket’s online presence is back! A number of years ago due to a lack of funding, a computer crash, distractions and general neglect, our lovely thinkbucket got some holes in it, developed some nasty rust patches and sank to the bottom of a deep, dark well. However, it has been recovered and skilled artisans have been crafting its repair. In recent years the Thinkbucket team have returned to contribute to various conferences in Northern Ireland. We were always asked about our online presence, or lack of it. www.thinkbucket.org still exists and will hopefully be returned to its full glory soon. Sadly, we lost the vast majority of our online resources in The Great Thinkbucket Computer Crash of 2005. If you saved any of those we’d love to try and recover the archive. We still think that there is a huge need for creative resources for peacebuilding practitioners and those working towards social change. We would love to be able to help provide those again at some point. In the meantime, our aim is to use this space to share creative approaches to peacebuilding from around the world. We view the concept of peace in very broad terms and will be sharing a wide range of ideas that help cultivate peace. We hope this is a space that acts as a catalyst for creativity. Your creativity. Amazing work is being doing across the world. Thinkbucket exists in order to uncover it, explore it and share it. We'd love you to get in touch with any ideas, links etc that you'd like Thinkbucket to share.